Complementary Ebook from SecureDocs Virtual Data Room. Starting a business without Venture Capital has its challenges, but for Backblaze, a Silicon Valley successful cloud-based consumer data backup service, it was well worth it. This ebook explains how and why they did it. 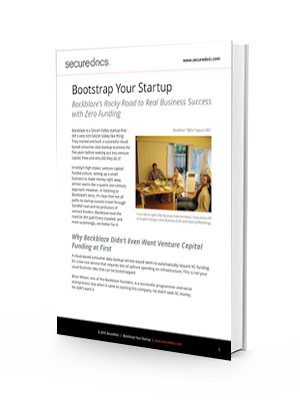 Interested in learning about how and why startups choose to bootstrap? Download this whitepaper and find out.